An activity that is not normally accomplished in man-made structures or in stationary facilities. The Golden Empire Council's High Adventure Team strongly recommends that Scouts not only demonstrate the skill sneeded for any high adventure outing prior to an outing, but that a minimum age of 14 be set to assure adequate maturity and endurance. 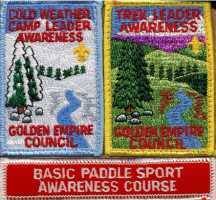 Note that the BSA High Adventure Bases each establish a minimum age requirement for the same reasons. Please referr to the 'Guide to Safe Souting' for additional requirements for High Adventure outings. email the HAT Chairperson at hat.chair at gec-bsa dot org for more information.